The Initiate is a puzzle and horror game by indie outfit Deceptive Games, which is set in a creepy house and stars Nathan Rockford, a man who has lost his memory and must go through a series of trials to discover what’s going on and who his mysterious captors are. This isn’t far removed from the typical video game plot then, and truth be told this game (which is played from a first-person perspective) does have a pretty good atmosphere which at times reminded of the 90’s game Thief. The Initiate has no stealth gameplay or combat to speak of, though, and just focuses on the puzzles. Also, the game’s promo blurb states that the house The Initiate takes place in is “full of traps and puzzles”. This is rather inaccurate though, as I did not have to worry about any traps during the course of my playthrough, only the puzzles, which I’ll get to later. Upon booting the game I wasn’t happy to discover that The Initiate does not have controller support, meaning those fond of playing PC games from the comfort of their couch using a gamepad (a growing number of people these days, I’m sure) will be forced to play this with keyboard and mouse instead. Of course, it’s still possible to use third-party software to play with a controller, but gamepad support would have been welcome here no doubt. You may not have fun looking for clues in The Initiate’s world. Also, after loading a saved game I noticed I was unable to turn around in the game with the mouse, and had to enter the game menu and hit resume for the mouse controls to work properly, a minor niggle which I expect Deceptive Games to path soon enough. And despite the fact that the controls are revealed to players during the course of the game, there’s no way to redefine these from the options menu, which is something I missed. Of course, given that the game features the standard first-person shooter controls (like using the ‘c’ key to crouch, for instance) this is unlikely to cause any confusion, but having the possibility to redefine these in the options menu would have been nice. During my time with The Initiate I also noticed the video card fan kicking in and whirring louder than usual, especially with anti-aliasing enabled, suggesting the game might not be that well optimized under the hood. This is puzzling considering The Initiate is certainly nothing special graphically-speaking. Of course, given that this is an indie game it is not realistic to expect Resident Evil 7-calibre visuals here, and truth be told The Initiate does boast pretty decent graphics taking into account it wasn’t made with the kind of resources the major studios have at their disposal. Technical issues aside, given that The Initiate is a puzzle game at heart, it’s clear that the quality of these will break or make the game. Sadly, these rely too much on players having to memorize things, making most of the puzzles and exercise in tedium. An example of this is having to rotate a series of painting and photo frames scattered throughout the house looking for text written behind them, which provides clues needed in order to solve a puzzle involving books later on. Pretty, but useless… There are plenty of 3D objects for you to look at in The Initiate. 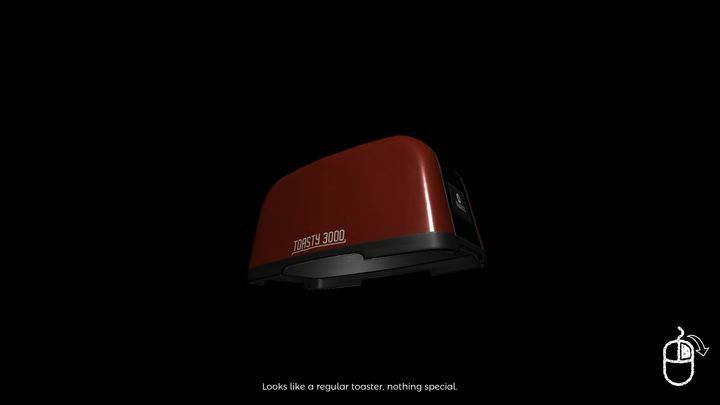 And speaking of having to rotate stuff, there are plenty of items scattered throughout the house which you can view and rotate in 3D, from women’s shoes to toasters. Some of these actually look quite pretty, but most are not required to progress in the game, and are therefore useless (this is something that silent protagonist Nathan mentions more than once in the items’ text descriptions too). Going back to the puzzles though, the fact some are a bit obscure and often require note-taking doesn’t help matters here either. An example is a puzzle involving a safe early on. 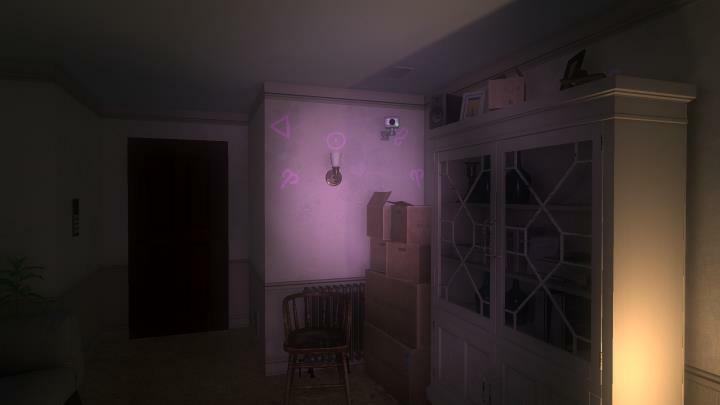 You are given an ultraviolet light at some point (you also get a regular flashlight too) which lets you see text and lots of strange symbols which have been scribbled on the house’s walls for some reason. 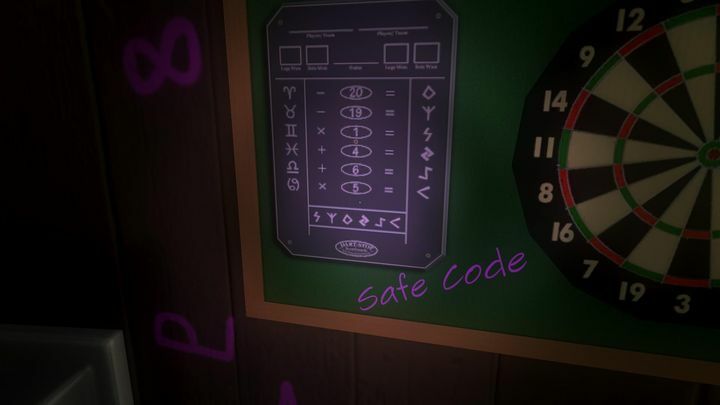 Each symbol is associated with a specific number, and you have to perform a series of calculations in order to obtain the safe code. I found myself having to do this on paper, thinking the game’s makers could have come up with a more gamer-friendly approach to their puzzle-design. 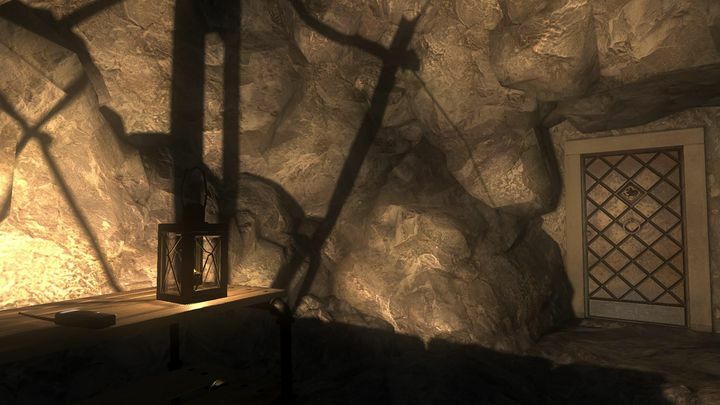 In other cases, puzzle-solving in The Initiate involves plenty of backtracking, such as when solving one late puzzle in which you have to place candles of the right colour on candle holders scattered throughout the house, backtracking to rooms you’ve previously visited. Of course, as is the case with The Initiate’s other puzzles you’ll have to memorize (or note down) the information needed to get through the puzzle. This often feels like work, and may have you searching for an online walkthrough sooner rather than later. A good memory is required to solve some of The Initiate’s puzzles. Also, there’s little payoff in the end too, and little is revealed of the game’s mysterious captors, although there’s an interesting binary choice at the end (and one of the choices might reflect your mood by the time you reach the end of this, that’s for sure…). The Initiate is not the best puzzle and horror game you can get for your money then, and its focus on memory-based, tedious puzzles and need for backtracking throughout the game means this is not a great gameplay experience. This is a game to avoid then, as there surely are better examples of the puzzle genre which are actually fun to play through and offer a better gaming experience than The Initiate does. This game was reviewed using a code provided by the developer.